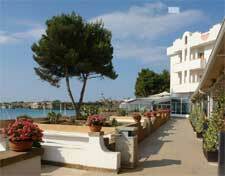 Hotel Fontane Bianche Beach Club offers rooms and bungalows on the seaside, 15 km from Siracusa, 18 km from Noto. Here you will find swimming pools and 3 restaurants. Outdoor you will find 2 pools, one for adults and one for children. The 3rd swimming pool is located in the Beach Club's wellness centre, The Fontane Bianche also offers a sports areas with tennis courts and football fields, and a private beach.